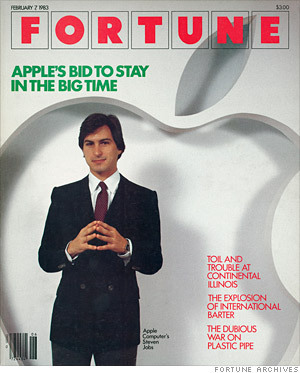 A gallery of Fortune's coverage of Apple and its visionary leader. "I get my jollies building good computers," says Steven P. Jobs, 27, chairman of Apple Computer. Critics of Apple's product line might assume Jobs hasn't had a good belly laugh in some time. Apple's first, and, so far, only big winner is the Apple II, six years old and showing signs of age. But during the past three years Apple as been working on a new computer called Lisa. Jobs is betting that Lisa -- though five times the price of the Apple II and aimed at a different market -- will keep him jolly by keeping his company in the forefront of a rapidly changing industry. An anthology of 17 classic stories spanning the years 1983 to 2011.